Just as we are about to mark the 30-year anniversary of the web’s invention at I Annotate 2019, and only two years after the W3C’s adoption of web annotation as a standard, this new record shows how annotation is realizing the original promise that Tim Berners-Lee sketched out in his 1989 document describing the World Wide Web. Register now for I Annotate 2019, Wed 22–Thu 23 May at the American Geophysical Union’s newly refurbished “net zero” headquarters in Washington DC. We continue to see strong growth in annotation, with each quarter setting new annotation records over the same quarter in the previous year. As you can see in the graph below, the pace of each new million annotations is accelerating. We also see similar growth in the number of new people annotating and active annotators in any period. In February, over 10,000 new users signed up to begin annotating, putting our total users at over 215,000. The seasonal dip in new annotations in the spring and summer quarters shows a strong connection between annotation activity and the traditional academic schedule. Hypothesis is building on the growing use of annotation in teaching and learning with the release of our new LMS App. Now educational institutions can integrate Hypothesis directly into their learning management system (LMS) to make it easier for students and teachers to annotate with single sign-on and automatic private groups for each class. In its first term of use this spring, over 400 classrooms are already using the new integration and institutions are starting to join our free pilot program. Install the Hypothesis annotation app into your LMS and join our free pilot program. 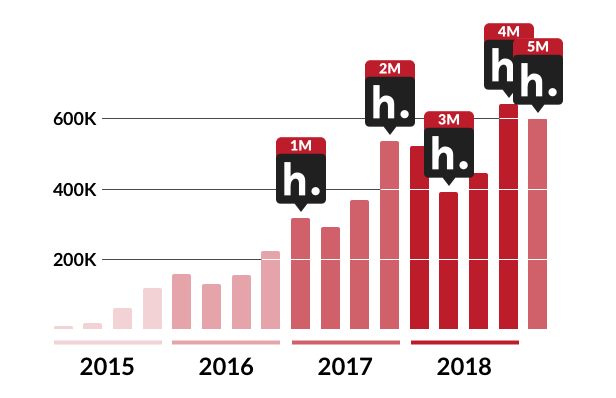 Hypothesis has also been adding new partnerships to spread annotation across the scholarly and publishing ecosystem, including publishers, scholarly societies, and other technology providers. Read more about how people are using annotation in all parts of the publishing workflow in each of our 42 partnerships shown below.